It is easy to forget that a pet’s world revolves around its mouth. 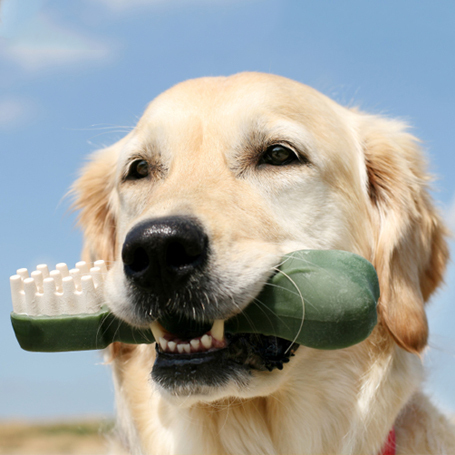 Poor dental hygiene can leave its mark on your pet. Bad breath (halitosis) is an abnormal condition in cats and dogs, often indicating a serious underlying condition called periodontal disease, which affects the mouth, gums, and teeth. Periodontal disease is the most common medical disorder among pets nationwide, affecting more than 80 percent of dogs and 70 percent of cats by age three. If left untreated, it can develop into serious health problems. Advanced dental disease significantly impacts your pet’s quality of life, leading to oral pain that makes eating difficult and resulting in chronic discomfort. In some cases, harmful bacteria originating in the mouth can enter the bloodstream, causing serious complications of the heart, kidneys, and liver, as well as other systemic disorders. Fortunately, due to its generally slow rate of progression, dental disease is exceedingly preventable. Just like in humans, a good oral health routine is key in avoiding most types of periodontal disease. The first (and best) line of defense in preventative dental care are examinations and cleanings. In addition to comprehensively evaluating your pet’s oral health, these appointments consist of hand scaling and curettage to remove plaque and tarter, polishing, fluoride treatments and sealant applications, all improving tooth and gum health significantly. The field of veterinary dentistry has developed rapidly over the past fifteen years and is now approaching the same sophisticated techniques that are available in human dentistry. Research has proven that pets that have received regular veterinary dental procedures and professional cleanings have an increased life span and better quality of life.